Oshkosh manufactures a variety of trucks, the majority of which are used for defense. They are the manufacturer of defense vehicles, joint light tactical vehicles, snow removal vehicles, light combat all-terrain vehicles, and much more. We entrust these trucks for a variety of military needs and purposes. You would be surprised to learn that the stock alternators that power these trucks are simple, 100 Ampere alternators, available in both 12 and 24-volt types. 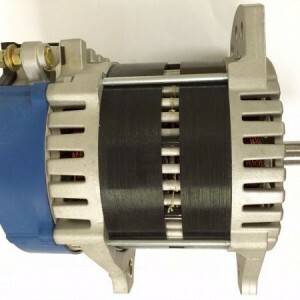 This type of alternator provides a high output, but also a high RPM. When a heavy-duty vehicle sits at idle, it requires a higher electrical load than a standard car, truck, or SUV. Typically, these vehicles have a heavy duty alternator, such as what the Oshkosh truck alternator is, to satisfy that load. Unfortunately, what comes with these heavy duty alternators is high RPM. Eco-Tech alternators have the unique ability to satisfy the large electrical load needed without a spike in RPM. These high-output, low-RPM alternators allow a vehicle to comfortably sit at idle, without the extra drag on the engine. Switching out a stock Oshkosh truck alternator with an Eco-Tech one is a smart choice. Allowing a high-output, low-RPM alternator to do the job reduces wear and tear on the engine, reduces wear and tear on the alternator itself, and extends battery life by draining it less. An Eco-Tech switch also negates the need to install extra equipment, such as high idle and load shedding devices. Best of all, an Eco-Tech alternator saves on fuel, reducing engine drag by approximately 50 percent. Not only is an Eco-Tech choice good for the environment, it saves you money on wear and tear, replacement parts, and improves your fuel economy.